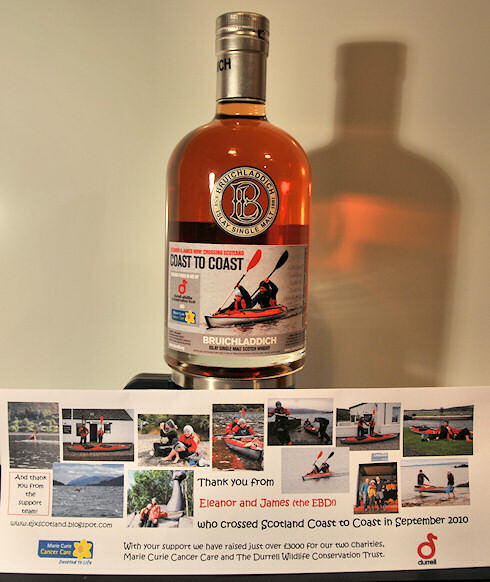 Now for the history behind the bottle: Let me take you back to August, to the Crossing Scotland in an Inflatable Kayak entry, followed up in September by the From Islay across Scotland, by Kayak entry. Yes, this is of course all about James and Eleanor crossing Scotland in an inflatable Kayak. You can read their own story (and the story of their support crew, namely Sally) in their Eleanor and James Crossing Scotland Coast to Coast blog. Just last week the Press & Journal also reported about their adventures again in Kayak girl, 11, finishes 60-mile marathon. For the bottles you have to go to the Bruichladdich sponsorship entry, which explains most of the background. Last week I delivered my sponsorship money cheque (which will go to Marie Curie Cancer Care and The Durrell Wildlife Conservation Trust as Eleanor and James' chosen charities) and in return picked up my special bottle. Thank you again and congratulations to Eleanor, James and Sally for their achievements and reaching over £3,000 in sponsorship and donations!